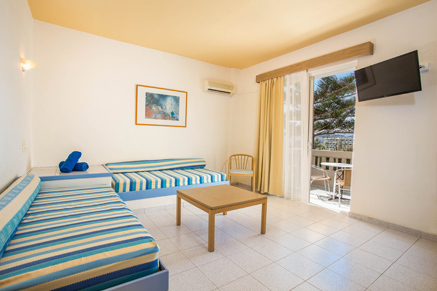 Welcome to family hotel Irinna, located only 10 minutes walking distance from the sandy beach of Faliraki, Rhodes. Designed in a classic, simple style and oriented towards both east and west, our rooms make our guests feel at home. Fill our reservation form and we will reply to you about the room that fit to your needs and the availability. Irinna Hotel Apartments offers the necessary facilities to make our visitors’ vacation easy and simple! 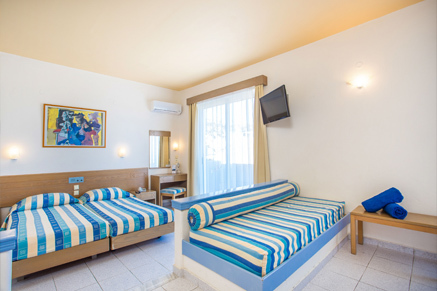 Named after the Dodecanese ancient poet, Irinna Hotel Apartments is a family-run 3-star hotel of 23 apartments, located only 10 minutes walking distance from the sandy beach of Faliraki, Rhodes. Built and maintained with daily care from its owners and unique staff, Irinna Hotel Apartments has been creating carefree summer memories for 25 years and counting. 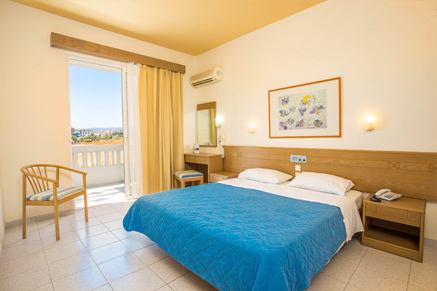 Having as a big advantage its friendly, cosy and casual atmosphere, the hotel is only within small distance from all the necessary amenities as well as the beach. The quiet and relaxing environment along with the personalised care is what our guests have appreciated and loved over the years. One-bedroom apartments, ideal for small families. Two bedrooms apartments are very convenient for larger families or group of friends. Τα διαμερίσματα δύο υπνοδωματίων είναι πολύ βολικά για μεγαλύτερες οικογένειες ή για παρέες φίλων. DON'T WAIT! SCHEDULE YOUR VACATION TODAY!